Chicago’s Father Michael Pfleger has never been afraid to say what is on his mind. With the announcement of Chicago’s loss of the Lucas Museum, Fr. Pfleger had some harsh words for the Friends of the Parks. Taking to Facebook and Twitter Fr.Pfleger called the group an “elitist GANG.” When asked to elaborate by DNA Info, Fr. Pfleger doubled down on his remarks saying, "Let’s call them what they are: They’re a gang of self-righteous elitist people.... Tell me the difference between Friends of the Parks and the Gangster Disciples?” His remarks have set off a firestorm in local and social media. Though few would argue Fr. Pfleger’s knowledge of South Side violence gangs, the remarks go far to highlight the divisive passion surrounding the Lucas Museum project. The long battle is over. George Lucas has decided to take his proposed Museum of Narrative Arts out of Chicago. The announcement came after the project was held hostage by a lawsuit leveled by public space advocacy group, Friends of the Parks. Lucas will once again look to California to build his $700 million museum. “Despite widespread support of the project from Chicago’s cultural, business, labor, faith and community leaders and the public,’ remarked Mayor Rahm Emanuel in a statement released on Friday, “a legal challenge filed by Friends of the Parks threatened to derail this once-in-a-generation opportunity. We tried to find common ground to resolve the lawsuit – the sole barrier preventing the start of the museum’s construction.” The announcement does not come as a big surprise to most in Chicago. In the last week Friends of the Parks released a list of demands that included taking 5% of the museums revenues for a parks fund, and a moratorium on any building on the lakefront for the next 100 years. Some have called the list a form of extortion, and few believed the city would cave to the demands. The 300,000-square-foot museum was designed by MAD Architects. The MAD design is the second design for the museum, which was originally planned to be built in San Francisco. The Friends of the Park took greatest issue with the location of the museum on the lakefront, which they believed violated the public trust doctrine. The use of the lakefront in Chicago is often a point of contention. Very few projects have been built on the lakefront since it was formed when the burnt remains of the city were pushed into the lake after the Great Chicago Fire in 1871. Despite this, other museums including the Shedd Aquarium, the Field Museum, and the Adler Planetarium, where privately built along the lakefront over the last 100 years. 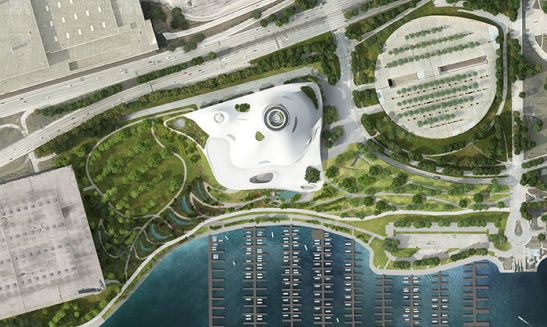 There is a new twist in the story of the proposed MAD-designed Lucas Museum of Narrative Arts in Chicago. As reported by Crain’s Chicago, the public space advocacy group Friends of the Parks has outlined a list of demands of the city in order to move forward with the delayed project. 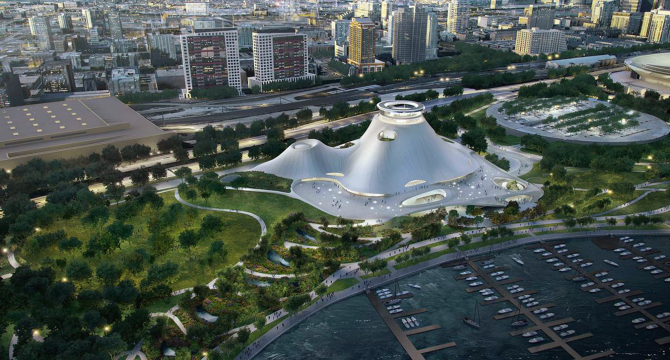 Friends of the Parks (FOTP) launched a lawsuit against the City of Chicago in order to stop the building of the Lucas Museum on public land along Lake Michigan’s shores. The ongoing federal suit has left the project in a state of limbo. With George Lucas anxious to move forward with the project, other cities are being considered for the Museum. The site of the museum had already been moved to Chicago from its original location in San Francisco after similar delays. The Friends of the Parks cite the Illinois Public Trust Doctrine, which outlines the use of the lakefront, in their argument. The group had adamantly opposed any development east of Lake Shore Drive. Recent reports by the Chicago Sun-Times indicated that the stance of the group might be shifting. Now Crain’s has acquired a list of demands that would need to be fulfilled in order to move the project forward. This latest move by FOTP supports rumors that the city and the group are at least interested in negotiating. Far from a simple list of compromises, the FOTP list calls for major legislation for the lakefront. The most significant demand includes a permanent lock on lakefront development for the next 100 years. 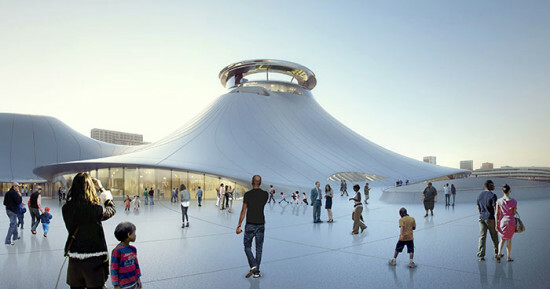 Others deal directly with the Lucas museum. Most notably, the list stipulates that the museum be built on the current site of the McCormick Place Lakeside Center. The idea was first floated by Mayor Rahm Emanuel in an effort to keep the museum in Chicago. Skeptics of the proposal point out that it would cost an additional $1.2 billion dollars of taxpayer’s money. The original proposal was to be paid in full by George Lucas. FOTP also demand the 5% of the museum’s revenues would be reserved in a fund for parks across the city. With patience running out, many think that the fate of the museum is sealed. Both Los Angeles and San Francisco have expressed their interest in hosting the museum. According to a report by the Chicago Sun Times, public space advocacy group Friends of the Parks (FOTP) has voted to drop the lawsuit against the City of Chicago blocking the Lucas Museum of Narrative Arts. The Sun Times quotes a “highly placed source” as saying the board voted to restart negotiations to “move forward with the Lucas Museum.” The Sun-Times also reported this week that Mayor Rahm Emanuel was attempting to persuade FOTP to drop the lawsuit by supporting one of the groups other projects—the “Last Four Miles." This proposal would expand access to lake Michigan by turning more of the Lakefront into public land.